Hank Williams died young, aged only 29, but he was an alcoholic, skinny as a stick, and suffered from lifelong health problems, so he looked a good decade older and sounded it, too. The potently soporific I Saw The Light gives the role of the country-western legend to Tom Hiddleston, who’s almost as old as Williams looked, and then covers the English actor’s forehead in a thick of paste of makeup to hide the wrinkle lines. So he looks a little bit like the Hillbilly Shakespeare, albeit more dashing, but not like the young man he’s supposed to be. And when Hiddleston sings “Lovesick Blues,” he sounds good, but lacks conviction in his voice. He plays Williams as though he were the most genteel philandering, pill-popping boozehound to ever die in the back seat of a car. It was a baby blue Cadillac, so maybe that gives it a touch of class. The problem with I Saw The Light—one of them, anyway—is that the movie can’t seem to conceptualize Williams beyond his drinking and his womanizing, but tackles both listlessly. Writer-director Marc Abraham (Flash Of Genius) takes dramatic license with Williams’ story, cutting some events out entirely, and putting many of the most important ones off screen. Maurice Pialat’s superb Van Gogh did the same thing, and actually took it further by excluding all the most famous incidents in the artist’s life; it too depicted its subject as a sickly man who drank and had difficult relationships with women. But it did it with subtlety, purpose, and an unsentimental edge, and I Saw The Light doesn’t have any of those. It just hammers the same points (he drank, he cheated, he got sick, he drank some more) over and over, before Williams dies—off screen, of course. Perhaps it would seem pathological, if I Saw The Light had a spark of insight or psychology to it. The question of “Why?” never comes up, and despite Elizabeth Olsen’s strenuous efforts to breathe some life into the role of Williams’ first wife and manager, Audrey Sheppard, no character in the film ever comes across as more than an accent—not even the typically engaging Hiddleston. Attempting to affect Williams’ distinctive body language, he looks like a creepy animatronic figure, singing classics in his own voice through a rictus grin. It makes for an enervating watch, which is notable because I Saw The Light is a movie about beer-swigging country musicians who wear novelty suits and write songs of heartbreak. Actually, Williams is never shown composing; if characters didn’t occasionally mention it, you’d never know he was a songwriter, let alone one of the all-time American greats. I Saw The Light presents Williams’ career from 1944 up to his death on New Year’s Day 1953, en route to a special show in Canton, Ohio. A lot happened in those eight or so years, but the movie can’t seem to make a single memorable scene out of any of it. 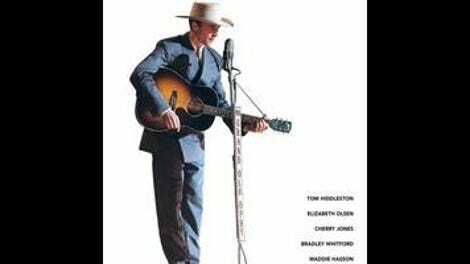 It focuses on Williams’ personal shortcomings, but, perversely, avoids his professional failures; this is a Hank Williams who never blows his first audition for the Grand Ole Opry, among other things. Instead, the viewer is presented with some of the most somnolent arguments to ever involve drinking and cheating, and a bevy of comically over-emphasized marginalia, often linked through super-slow dissolves that bring to mind late ’40s Hollywood at its creakiest. Williams’ lost performance on The Perry Como Show isn’t depicted, but damn if the movie doesn’t include a scene of Williams walking into the CBS building anyway. There’s no energy here, and no juice, aside from an out-of-nowhere close-up of bare breasts emerging from the parting curtain of a mink coat, and a few nice visual touches courtesy of cinematographer Dante Spinotti, best known for the films he’s made with Michael Mann. There’s a shot of Williams lumbering drunkenly out of the CBS studio in Manhattan and setting his drink down on top of a yellow cab that would fit in a more melodramatic movie, and moments here and there that bring to mind Spinotti’s controversial work on Public Enemies, but without the chaotic sense of movement. Even those, the movie manages to make glumly tasteful. Then again, if Abraham can’t make Hank Williams interesting, everything is bound to be a wasted effort.